Once upon a time, I joked that I should rename this blog “Vickilicious Knits Green Socks,” and I think at this point, my love of green knits is fairly well documented. Lately, I’ve moved from socks to sweaters, but as you can guess, green still factors heavily. Today I started a new green sweater, which ticks all the marks for projects I love: it’s a seamless, top-down raglan, knit in aran weight yarn, with just enough patterning on the back to make it interesting, and no closures to worry about. You probably know it better as the Leaflet cardigan, designed by Cecily Glowik MacDonald, available for free on Knitty. 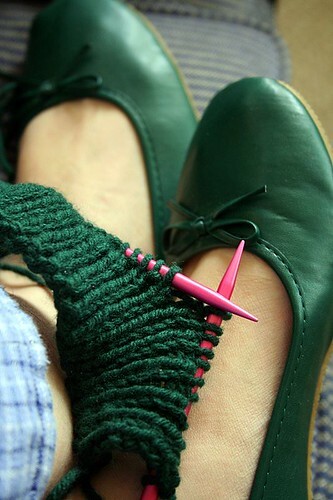 This photo of the yarn is not from this sweater, and it’s so old that I’ve actually worn those shoes out by now (they were fairly poorly made and overpriced ballerina flats from Urban Outfitters, and I adored the color but won’t get fooled again). But you may recognize this yarn from my Katelyn Basic Sweater, which has gotten a surprisingly huge amount of wear and keeps getting more comfortable and cozier. 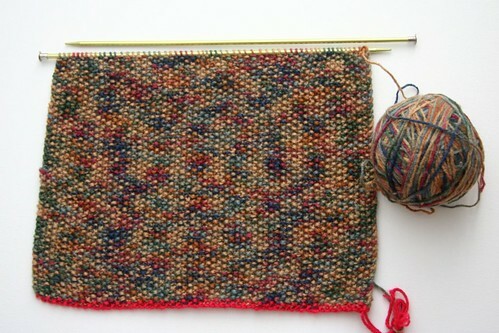 This yarn is one of those big box craft store acrylic yarns, Caron One Pound. 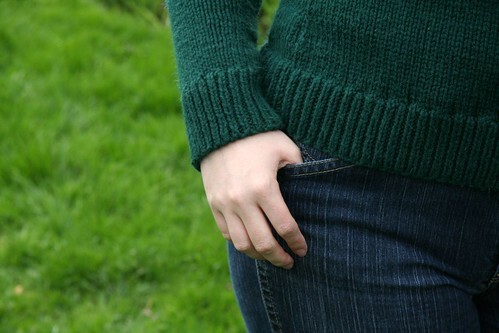 I read a blog post a while back with some fairly derisive things to say about sweaters knit in forest green acrylic worsted weight yarn bought from a big box craft store, and I felt all defensive and inferior because as I was reading it, I was wearing that sweater. I had literally just been thinking how well it had worn, what a treat it was to have something machine washable that didn’t smell when it got rained on, didn’t stretch out, and got softer and lovelier with each wearing. Oh and as a major bonus, cost about $8 total, which made my student-loan-dependent wallet ecstatic. 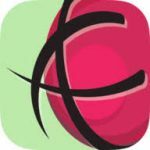 I don’t want to be some sort of acrylic apologist because I don’t actually think it’s necessary and anyone inclined toward yarn snobbery probably isn’t going to be reading this blog anyway. But I will say I loved my Katelyn sweater so much that I had zero hesitation about using the rest of the Caron I had purchased on this project, which I hope to enjoy wearing as much as I’m already enjoying knitting it. Pick a color that makes your heart sing. 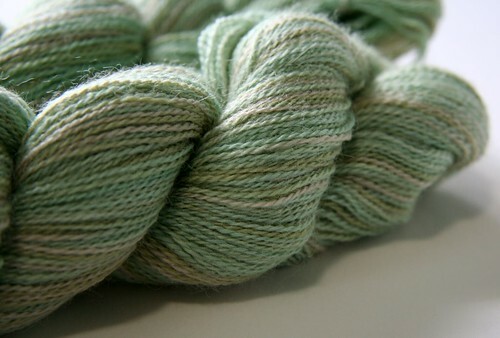 Bonus points if it’s a particularly saturated or exciting color that is difficult to achieve in dyeing natural fibers. 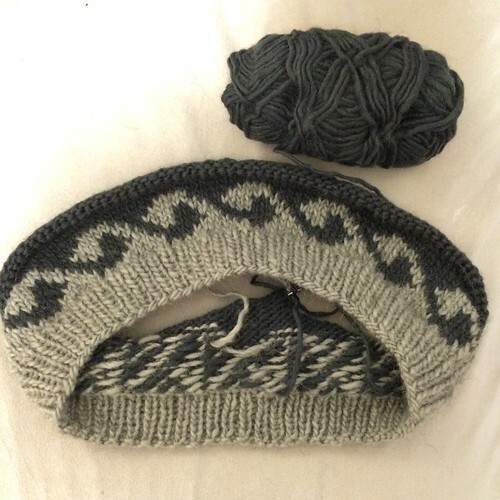 Knit at the recommended gauge, for real. It’s not pleasant to knit any yarn at too tight a gauge, and the people who call acrylic “squeaky” and unpleasant are probably trying to force it into things it doesn’t want to do. Be diligent and careful about following the pattern correctly. Be painstaking in your finishing and do your absolute best seaming. Gently “kill” the acrylic before the piecing stage. You can either soak it in water or spray it, then steam it with an iron. Manufacturers steam acrylic knits all the time to neaten up the stitches and give a nice drape, just as you would do with a natural fiber garment. If the garment is saturated with water, you can also run the iron over it – using a press cloth – at a fairly low temperature, but this will flatten it out. That’s not necessarily a bad thing and can make it more drapey and thin, but you can experiment. If you skip this step, your yarn will soften considerably with a machine wash and dry, so have confidence that it will end up a nice garment even if it doesn’t immediately seem that way. Machine washing is good. You can lay it flat to dry, but I find that machine tumble drying only on low heat actually makes the sweater softer and fluffier, especially if you use a nice fabric softener (I use either Downy or Bounce sheets). The low heat is the most critical part of that sentence. If you dry anything acrylic on high heat, be it sweaters, blankets, or fleece jackets, they will become that crunchy, dry texture, full of pills, and unpleasant to the touch. To prevent pilling or mechanical damage, wash your sweater with other “soft” garments like blouses, underwear, and socks. I wash all of my clothes on a low agitation or gentle cycle, which keeps them from stretching or pulling in weird places. I also wash my jeans and corduroys separately from other clothing, as I think they are the main culprits in damaging knits. Above all, don’t treat your sweater as some inferior thing because you didn’t spend $150 on a Merino wool-unicorn down blend. Yes, luxury yarns are nice, and I love natural fibers just as much as the next knitter, but they are not necessary to a well-made, attractive, and wearable garment. Is every blouse in your closet silk or linen, or do you have some cotton or rayon blends? Are all your store-bought sweaters 100% cashmere, or do you allow yourself some garments that are attractive, machine-washable, and affordable? 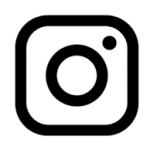 One of the most extraordinary things about knitting is that it is accessible to such an enormous variety of people, with the possibility to produce beautiful, wearable garments in any budget or skill level. Treat yourself to an $8 low-maintenance sweater every once in a while, without feeling like you’re a lesser knitter for it. I didn’t start this post as an acrylic-lover’s manifesto, but it seems that’s where it’s gone. Of everything I’ve knit so far, my acrylic sweaters are the projects that have gotten the most wear, been the easiest to own, and fit the best in my life and budget. I’m excited that this project will be another such triumph. Ravelry does a funny thing to my sense of priority: it allows me the illusion of an organized, systematic approach to knitting via the queue. I pretend that I’ve planned out my projects, matched them with their yarns and sometimes even buttons or closures, and in the biggest delusion of all, I actually believe that I will follow through with this plan as imagined because I’ve put the projects in my queue that way. Ha. Seriously, ha! I am the most fickle, mercurial person I know, prone to dramatic and swooping changes in opinion, career, romantic affiliation, and so forth, with little or no prior warning. Oh sure, I may have an inkling here or there with the major life events, but with art, or knitting? That is where my id runs rampant and I do whatever I want. Parenthetically, how many lovely, sunny days have I had where I might have photographed a glimpse of this project? Might I have arranged it artfully on my sun-soaked windowsill and captured its most flattering attributes? No, no, I wait until the middle of the night in the depths of a rain-soaked week to decide now, now I must talk about this lace. I think my project history has revealed no small love affair with vine lace. 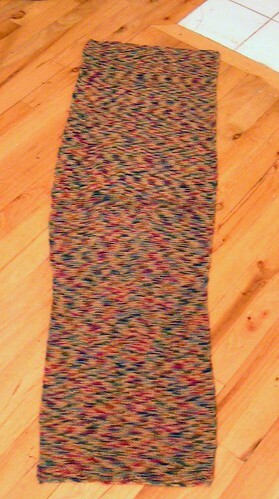 It suits my temperament so well, as it is the same repeat, offset by one stitch, alternating every other row. The lace itself feels nicely symmetrical, balancing the increases and decreases within a repeat that is just long enough to stay interesting but short enough that my hands can whip through it from memory. I am consistently delighted by the visual impact you can achieve from such elegant combinations of stitches, and I think it looks flowing, organic, and perfectly fabulous at any scale. 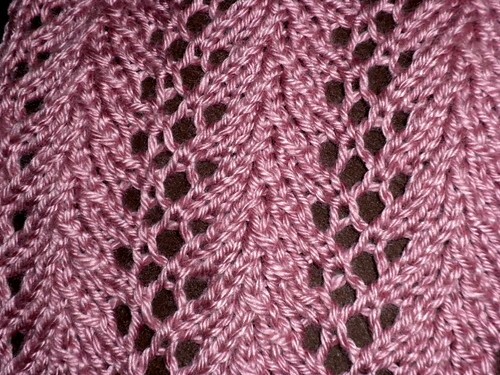 I capital-L LOVE vine lace, and I doubt this fact will ever change, however much of it I knit. I’d seen the Vine Lace Vest (PDF) before, as I subscribe to Classic Elite’s Web Letter (I recommend you do too – they have some great patterns). I’m not sure why it didn’t immediately grab me, seeing as it has almost all my favorite project components: vine lace, interesting but not overly tedious construction, large-gauge lace that moves fast without looking clunky, no buttons or zippers, and a versatile, very wearable garment in the end. 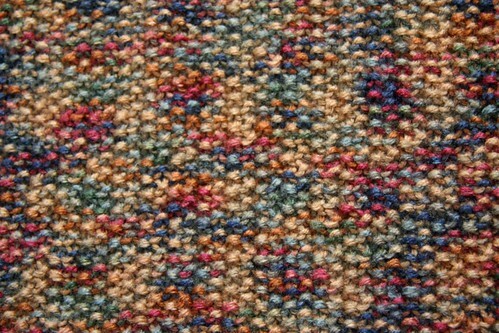 I am especially delighted to use stash yarn, this Simply Soft in a lovely, out of character dusty pinkish mauve color. I originally bought it for an ill-advised strapless top of some sort, which I knew, even as I queued it, I would probably not actually knit. I can’t explain why these very inexpensive skeins of acrylic wick at me the way they do, but I have a lot of them in my stash from my first years knitting, and I feel some sort of vendetta to turn them into garments I love. I have much nicer, vastly more expensive yarns hanging out in this glass-windowed antique secretary desk (I will, I promise, take a nice photograph of it sometime soon), but the shopping bags full of Simply Soft and Caron One Pound in the top of my closet weigh far more significantly on my mind. 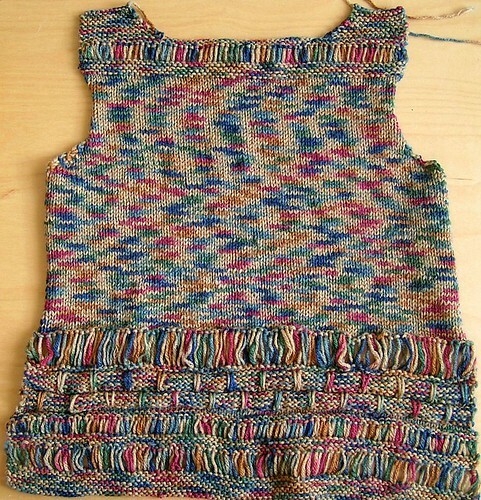 When I started knitting, I dreamt about making shrugs and cutesy cropped cardigans, specifically to wear over sundresses and summery blouses. Impatient with my knitting progress and annoyed that I couldn’t wear the same hand knits day in and out (I suppose I could, but it would get dull), I’ve filled my closet with 3/4-sleeve cardigans and store-bought shrugs, but they never feel as special as the ones I’ve made. 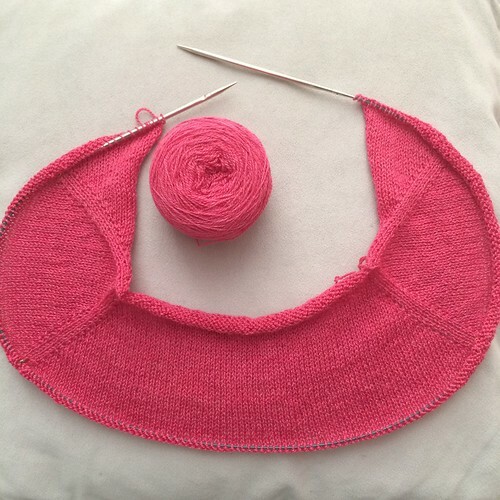 Combining the prospects of a new short-sleeve open lace shrug-type garment that would be fast, fun, and easy to knit, with the ability to all but completely use two skeins of Simply Soft toward which I felt an odd and lingering guilt, the decision to cast on basically made itself. The Vine Lace Vest immediately jumped my entire queue of carefully thought-out and planned projects, the basket of in-progress knits that are all but complete, save for some buttons or seams, and every one of my intentions toward orderliness and self-control. And I have not regretted it for an instant. It occurs to me that if I wait to photograph and post each of the eight FOs I currently have waiting, or the staggering pile of WIPs I’ve started, I will succeed in taking the entire summer off from blogging, which really hasn’t been my intent. 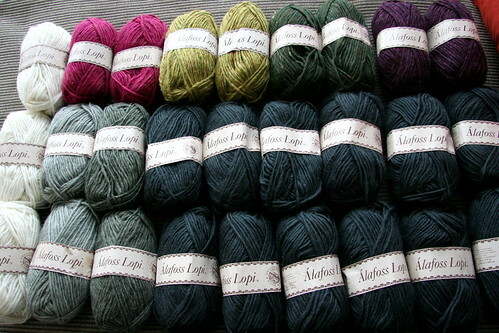 Moving forward, I have become utterly entranced by this yarn. 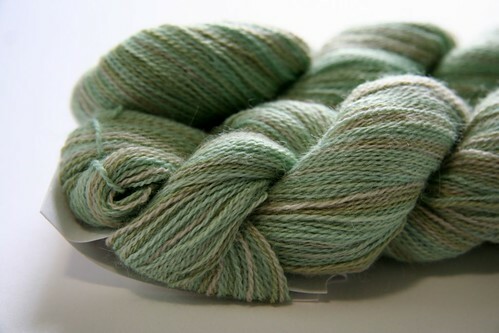 It is KnitPicks Shimmer Hand Dyed, a lovely baby alpaca and silk blend that has escaped my attention until now. I originally bought it for a little laceweight shrug project, thinking the variegation would look nice in the stitch pattern. The color is Eucalyptus, a subtle blend of light greens and pale tones. It wasn’t until I got it in my hands, though, that I realized just how special it feels. It is heavenly soft, a pleasure to touch. The silk gives it strength and smoothness that glides through my fingers, while the baby alpaca makes it weightless, with a delicate halo. 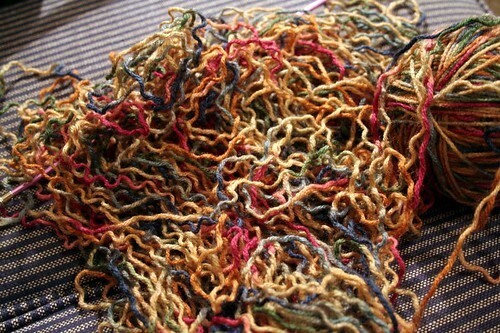 I decided this yarn needed to become something special, elegant, maybe even a little fancy. Also, I wanted to wrap myself in it. I searched Ravelry for an understated pattern which would showcase the beautiful texture and colors of the yarn, and I came up with the fabulous Upstairs Shawl. I have this green Calvin Klein satin dress that I bought earlier this summer, which I’ve decided to wear to a wedding in October. I am excited beyond words to try to complete this shawl in time to go with it. Man, I am a sucker for green lace.